This study describes the level of genetic variation and gene flow within and among populations of Prunus cerasoides in rehabilitated sites and adjacent intact forest. The seven microsatellite loci employed detected a total of 75 alleles (n = 401). Polymorphic information content (PIC) varied from 0.34 to 0.83. Between the adult populations there was moderate genetic differentiation with an F ST value of 0.0575, which suggests that the restoration plots had a similar genetic composition to that of the natural population. The gene flow assessment provides some interesting insights into the genetic diversity of P. cerasoides. In the 16 naturally occurring trees over 83% of the genotyped seed were fathered by unidentified trees whereas in restoration plot A only about 32% of the pollen came from an unidentified father. This proportion was even less in Plot C where 25% of the pollen parents were unidentified. The naturally occurring trees within Doi Suthep were surrounded by planted trees, which were contributing to the paternity of the seed crop. This result demonstrates that ‘‘fill in’’ planting should consist of locally sourced material if it is considered important to conserve the genetic integrity of the local populations. The authors thank Rungtiwa Punyayod for helping with seed collection and the germination of seedlings in the nursery. We are deeply grateful to Jake Clarke of East Malling Research (EMR) for technical advice and support, Joan Cottrell and Tom Connolly for helping with data analysis. 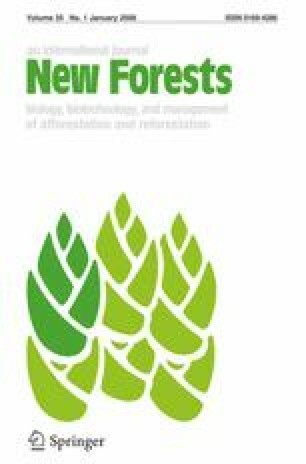 We are also grateful for institutional support of this work provided by Chiang Mai University and the Herbarium especially Dr. Vilaiwan Anusarnsunthorn and the Forest Restoration Research Unit (FORRU) attached to the Biology Department, Faculty of Science. Financial support came from International Plant Genetic resources (IPGRI-APO) and East Malling Research (EMR, UK).